La Trinità di Masaccio is one of the most important paintings in art history…..and it came very close to being destroyed! The fresco is on the wall of the left aisle in Santa Maria Novella, opposite the entrance through the cloisters. La Santa Trinità is the Holy Trinity; the Father, Son, and Holy Spirit. It was commissioned by unknown donors, probably from the Lenzi or Berti families, since they had tombs close by. La Trinità, completed in 1427, is the earliest known example of one point linear perspective. It is painted on a flat wall, but gives the illusion of space, appearing to be a 3 dimensional chapel. This is the start of early 15th Century Humanism, when Italian painting moved from flat, idealized art to a more natural, realistic style. 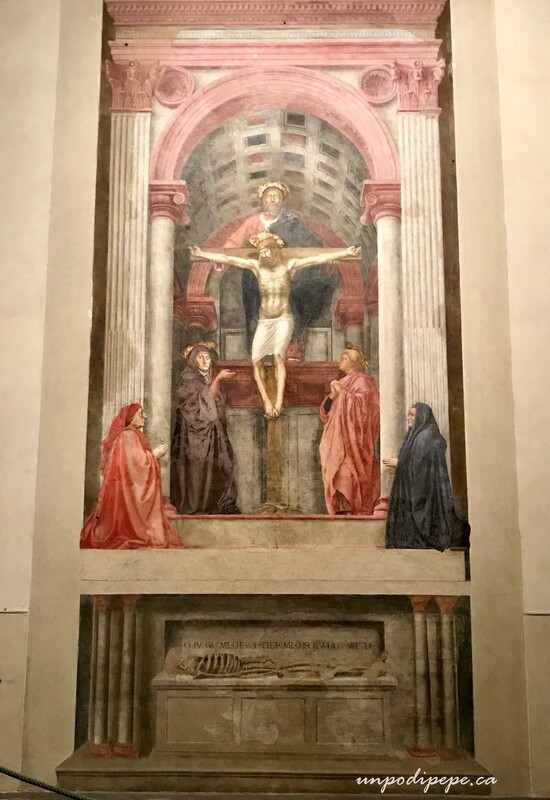 To create a sense of depth and space, Masaccio uses linear perspective with a vanishing point, chiaroscuro, foreshortening and directional light. This was all new at the time. The figures are life-size, emotional, and so realistic they look sculpted. Jesus is especially realistic looking, with his body affected by gravity. God is portrayed as a standing man holding up the cross, with foreshortened feet firmly planted on the ground. He is usually portrayed by a hand or as an old man floating in the clouds. Mary looks mournfully at the viewer, pointing up to Jesus as if to say ‘this is your answer to eternal salvation’. The praying witnesses are likely the unidentified donors, placed outside the ‘chapel’. Inspired by Brunelleschi’s newly rediscovered classical principles, Masaccio creates a convincing architectural space, especially the barrel vaulted coffered ceiling. The composition is magnificent, with many triangles further emphasizing the theme of ‘trinity’. The vanishing point is right at eye-level, guiding the viewer’s eye upwards and emphasizing the perspective of the ceiling. 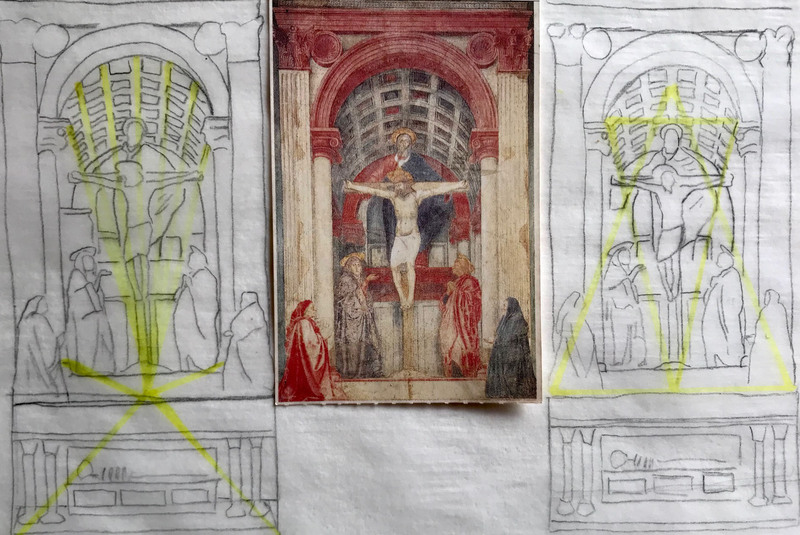 Masaccio apparently inserted a nail at the vanishing point- the ledge below the cross. He tied strings to this nail which left imprints in the wet plaster. He used these lines as a guide for the perspective. My quick sketches of the vanishing point, perspective lines and triangular composition. The colour image is my entry ticket from 2004! Masaccio was praised in Giorgio Vasari’s 1550 bestseller ‘The Lives of the Artists’. ** Masaccio was born Tommaso Cassai. ‘Maso’ is short for Tommaso and with the superlative ‘accio’, it meant ‘big messy Maso’. According to Vasari, this was ‘because of his complete lack of concern’ for worldly affairs or even how he dressed himself’. He was only concerned with his art. Masaccio’s most famous work is the Cappella Brancacci in Santa Maria del Carmine. In 1428, at the age of 27, he died suddenly of unknown causes. Many, including Vasari believed he was poisoned by a jealous rival. When informed of Masaccio’s death, Brunelleschi commented ‘Noi abbiamo fatto una gran perdita’-we have had a great loss. Masaccio did not live long enough to be well known in his lifetime, but his work inspired Fra Angelico, Fra Filippo Lippi, and Filippino Lippi. The Cappella Brancacci was completed by Filippino after Masaccio’s death. Back to La Trinità…In 1568, Vasari was commissioned by Cosimo I de Medici to ‘modernize’ Santa Maria Novella. Cosimo ordered all of the frescos to be plastered over and replaced with new ones! Aaaaaahhhh! Well-lucky for us, Vasari admired Masaccio and could not bear to destroy La Trinità. He secretly built a false wall in front, effectively preserving the work for almost 300 years. On the new wall Vasari installed an altar and painted the Madonna del Rosario. In 1860 Santa Maria Novella was undergoing renovations and workers, noticing an irregularity in the wall, discovered La Trinità. Unfortunately, it was detached from the wall, transferred to canvas and moved to the another wall inside. Detaching a fresco is done with the ‘strappo’ technique, which is complicated and fascinating. Italocanadese fresco artist Liana Tumino demonstrates the technique in this video. The bottom part of the fresco was either not noticed or ignored. It is a cadaver/ skeleton on an open tomb. Painted to look carved in the stone is written ‘Io fu già quel che voi siete, e quel chi son voi ancor sarete’ –I was what you are and you will be what I am. This is a Memento Mori, a reminder of our eventual death, like poor Yorick’s skull. The message can be interpreted as both ‘Do not take life for granted, live life to its fullest’ and ‘Prepare now for eternal salvation’. The second interpretation was more likely in the 15th century. Both parts of the fresco were reunited in the original location in 1952. Death below, and the hope of salvation above. It suffered some damage from being transferred to canvas and then back to the wall. I am not the biggest fan of Vasari’s work, but in this case…yeah Giorgio! We can almost forgive him for the gaudy tomb he designed for Michelangelo… Almost. **The full title is ‘The Lives of the Most Excellent Painters, Sculptors and Architects’, in italiano ‘Le Vite de’ più Eccellenti Pittori, Scultori e Architettore’ often simply called ‘Le Vite’, first published 1550, updated 1568. Read more about Vasari in this post.